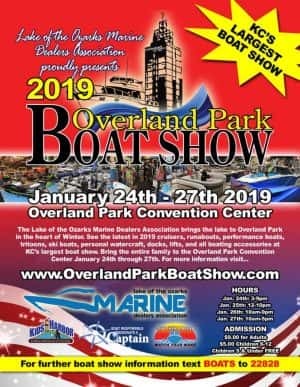 The Lake of the Ozarks Marine Dealers Association wants to welcome you to the Overland Park Boat Show for 2019! This is the premiere show for boating enthusiasts all over the Midwest. Here at this site you can find all the information you need on this great show. We will see you at The Overland Park Convention Center Thursday January ​24th through Sunday January 27th!